2visual4arts's Blog | In order to practice performing visual arts, the administrators of 2visual4arts are meeting regularly on the net and produce visual actions in public spaces and the big outdoors. For the thematical performance series they invite other performing artist world wide. The documentation of the action is published on www.2visual4arts.no, the facebook group site and co-operating venues..
“Document A” is an international performance project which pays homage to, criticizes or comments on dOCUMENTA (13), the biggest exhibition of Contemporary Art in 2012. The aim is to connect visual artists through the web and reduce cultural boundaries. “Document A” Homage to dOCUMENTA (13) by 2visual4arts. Submission and main exhibit dates: June 9th – Sep. 16th, 2012. The 2visual4arts team invites artists to contribute performative content to “Document A”, a collaborative performance art blog. We are interested in documented performance work which pays homage to, critiques, discusses, relates, damns, expresses love towards or just contemplates the biggest art event in 2012; dOCUMENTA (13) Germany. 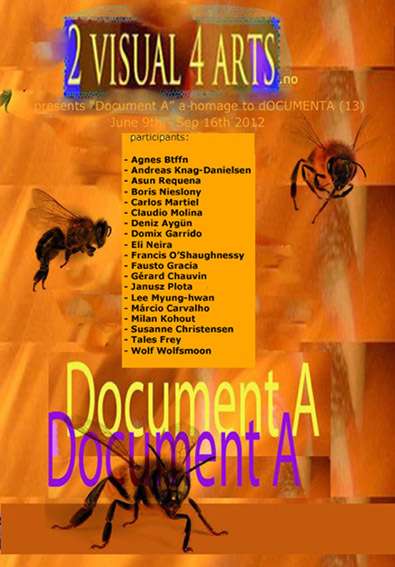 “Document A” is an international performance project which pays homage to, criticizes or comments on dOCUMENTA(13), the biggest exhibition of Contemporary Art on our planet. The aim is to connect visual artists through the web and reduce cultural boundaries. As a starting point, the content of the participating artists will be published on the blog 2visual4arts. Additionally, we ask each participant to also publish the content of “Document A” on her/his own blog/website or link to the “Document A” site: http://www.2visual4arts.no/. You will be able to print an information poster, which will be available on our website 2visual4arts, for pinning it up at art venues in your neighbourhood. Please send your documentation (1 video clip and/or 1-3 photos with tittles) of your performance as an attachment via e-mail. • Text explaining who you are (name, country). Translations in English with Google translate are accepted but every participant is responsible for her/his content. The duration of dOCUMENTA (13), 100 days.